Figure 1. Schematic setup for the measurement of acoustic startle and prepulse inhibition. Operant chambers (MEDNPW-5M, Med Associates, St Albans, VT, USA), equipped with five response holes, a food magazine at the opposite wall and a house light, and placed in sound attenuating ventilated cubicles. Both response holes and food magazine contain yellow LED stimulus lights and infrared response detectors. Figure 2. 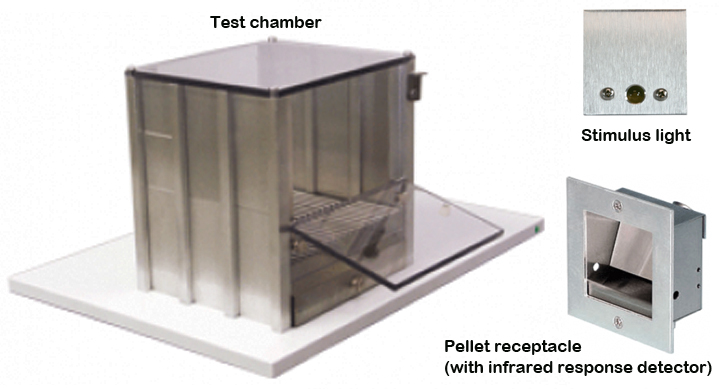 Example of test chamber, stimulus light, pellet receptacle used in conducting five-choice serial reaction time task (5-CSRTT). In general all mice are habituated for 5-20 min to testing conditions. Submitting investigators notes: "It is well established that prepulse intensity strongly modifies PPI. This indicates that strain differences in perceived salience of prepulse stimuli could interfere with the calculation of PPI and hence analyses of correlation with attentional performance. To control for differences in perceived intensity of prepulses when calculating PPI, an extensive acoustic startle response (ASR) curve is genered, and the startle threshold (ST) for each individual mouse is determined. In addition, to reduce, but not prevent the possibility of attentional processes modifying PPI, a passive PPI procedure with neutral prepulse stimuli and a short prepulse to pulse stimulus onset asynchrony (SOA) is used " (Loos et al . 2011). 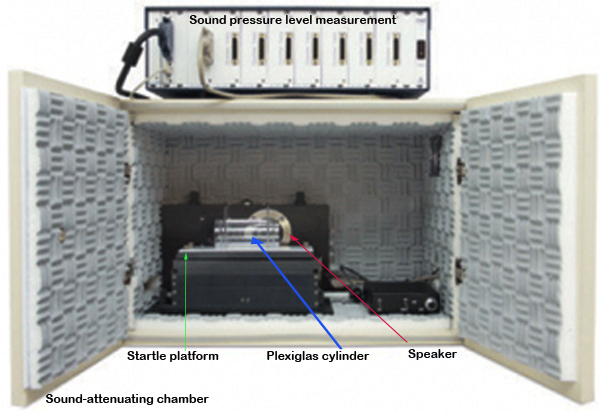 a. Acoustic startle and PPI are measured during one 45-min session in four Plexiglas cylinders in ventilated sound-attenuating chambers, placed on separate passive heavy vibration-free tables. b. During testing, a separate speaker provides white background noise of 75 dB. c. The intensity of the startle stimuli is calibrated with a microphone placed inside the Plexiglas cylinders in a closed chamber, while white background noise is switched OFF. Reported prepulse and pulse intensities are lower than the actual cumulative sound pressure level during testing (e.g. a 75-db pulse in addition to a 75-dB background noise add up to 78.01 dB). d. Each session is started with a habituation period of 5 min (refer to Fig. 3). 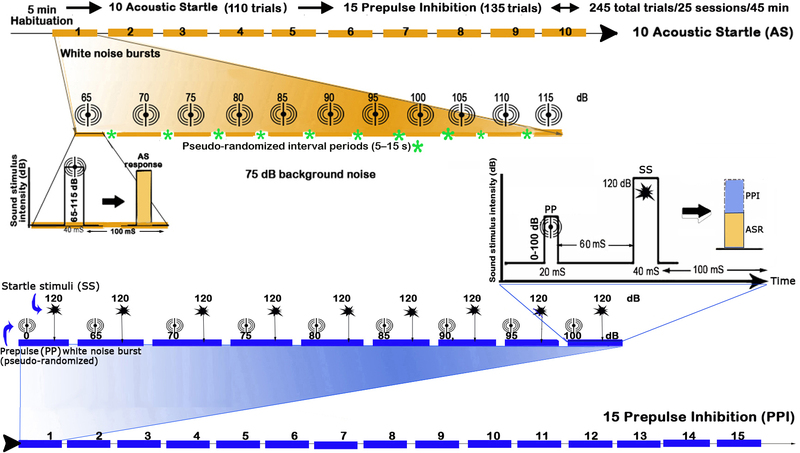 e. Following habituation, 10 acoustic startle (AS) trials with pseudo-randomized interval periods (5–15 s) and with white noise bursts at various intensities (65, 70, 75, 80, 85, 90, 95, 100, 105, 110 and 115 dB) are automatically initiated. f. Then immediately after AS trials, 15 PPI trials with white noise bursts at various prepulse intensities (0, 65, 70, 75, 80, 85, 90, 95 and 100 dB; startle intensity always 120 dB) in pseudo-randomized order are activated resulting in a total of 245 trials at the end of each session. f. Onset of white noise prepulse stimuli (20 ms; 1 ms programmed rise/fall time) and startle stimuli (40 ms; no programmed rise/fall time) are separated by a 60-ms interval (i.e. SOA). g. In each trial, the highest startle intensity peak (in relative machine units) is collected during the 100-ms interval after the startle stimulus, from which the individual mean highest startle intensity peak during the 100-ms null period before prepulse stimuli is subtracted. h. The startle sensitivity is determined for each mouse by determining the startle threshold (ST) at which a statistically significant startle response is measured (one-sample t-test, with average null period as reference value). i. The equipment is calibrated to allow for a wide range of startle intensities. The force generated by some mice at the highest pulse intensities, however, could exceed the dynamic range of the equipment (maximum of 2047 units) artificially reducing the percentage of PPI in subsequent analyses. When the number of such censored 120-dB pulse trials is more than 33% (e.g. more than 5 of 15), no PPI is calculated. j. The percentage of PPI is calculated as follows: PPI = 100 x [(mean startle intensity pulse) − (mean startle intensity pulse with prepulse) / (mean startle intensity pulse)]. Figure 3. Schematic layout of a single session of AS test followed by PPI measurement. Mice are trained to perform the 5-CSRTT task on an individually paced schedule in operant chambers. a. Mice previously food-restricted to gradually decrease their body weight to 90% of their free feeding weight are trained to perform the 5-CSRTT task. b. Mice are habituated to the operant cages for one session of 20 min, during which the house light is switched OFF, and the stimulus lights in the magazine and stimulus holes are turned OFF. c. On days 2, 3 and 4, purified precision pellets are distributed into the magazine at random fixed inter-trial intervals (ITI; 4, 8, 16 and 32 s), which coincided with switching ON the magazine stimulus light. d. An ITI is only initiated when the previous pellet has been collected as indicated by a magazine response, during which the magazine stimulus light is turned OFF. e. A session ends after 25 min or sooner when the criterion of 50 pellets is reached. f. During the 3rd day session, the mean number of responses into the empty non-illuminated magazine is recorded for further analyses. g. In subsequent sessions, a trial is started by the illumination of all 5 stimulus holes. h. A response into any of the 5 illuminated holes switches OFF the light in all 5 stimulus holes, switches ON the stimulus light in the magazine, and delivers a food pellet into the magazine. i. After the previous pellet is collected as indicated by a magazine response, an ITI is initiated and the magazine stimulus light is turned OFF. j. Although each sessions lasts for 25 min or 60 earned food pellets, as soon as a mouse earns 50 or more pellets in two sessions, or after 17 sessions, it moves to the next phase. Figure 4. Schematic representation of the 1st wk of 5-CSRTT training consisting of a habituation period and 4 magazine training sessions. a. During the 2nd week of 5-CSRTT training, mice are trained to perform an instrumental response into the stimulus holes to earn a reward. b. Trials are started by the illumination of only one stimulus hole. c. Correct responses into illuminated holes earns a reward; responses into non-illuminated holes are without consequence. d. As soon as mice earn 50 or more pellets in two sessions, or after 10 sessions, they are done with the training phase. Figure 5. Schematic representation of the 2nd wk of 5-CSRTT training to perform an instrumental response into the stimulus holes to earn a reward. a. A trial is started when a mouse makes a response into the illuminated magazine, which in turn, switches OFF magazine light, and after an inter-trial interval (ITI) of 5 s, a stimulus in one of the five stimulus holes is switched ON for a limited stimulus duration (initially 16 s). b. When a mouse makes a response in the correct stimulus hole, during stimulus presentation, or within the limited hold of 4 s after termination of the stimulus, the magazine light is switched ON and a food pellet is delivered. c. The latency between a correct response and the detection of a head entry into the magazine is recorded as magazine latency. 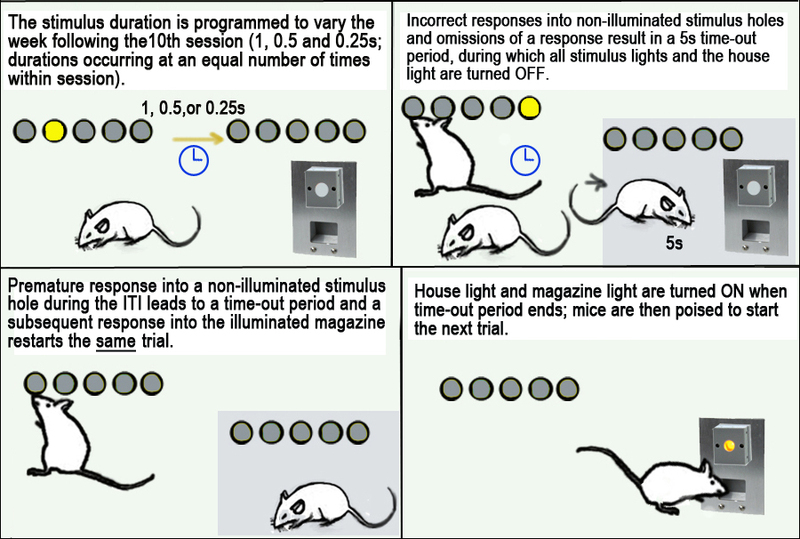 d. When a mouse responds either incorrectly into non-illuminated stimulus holes and/or fail to make a response, it is subjected to a 5 s time-out period, during which all stimulus lights and the house light are switched OFF. e. If a mouse makes a premature response into a non-illuminated stimulus hole during the ITI, it is also subjected to a 5 s time-out period, and a subsequent response into the illuminated magazine restarts the same trial. f. When the time-out period ends, both the house light and the magazine light are switched back ON and the mouse is poised to start the next trial. g. For subsequent 5-CSRTT sessions, the stimulus duration is gradually decreased to 8, 4, 2, 1.5 and 1 s when reaching the set criterion (omissions < 30%, accuracy > 60%, started trials > 50) or after 10 sessions at the same stimulus duration. h. Dependent measures or baseline 5-CSRTT performance is calculated from the 6th until 10th session at a fixed stimulus duration of 1 s, and the average of these sessions is used as standard 5-CSRTT performance. i. During these baseline sessions, the average percentage of premature responses is recorded and used for further analyses together with the average latency to collect the reward from the magazine after a correct response (calculated only if a mouse responds correctly five times during one or more baseline sessions). Figure 6. Schematic workflow of the 5-CSRTT toward a fixed stimulus duration of 1 s and beginning with 16 s.
a. In the week following the 10th session of fixed stimulus duration of 1 s, on Tuesday, the stimulus duration is programmed to vary (1, 0.5 and 0.25 s; durations occurring at an equal number of times within session). b. Mice are excluded from analyses when they initiate fewer than 30 trials on average or make no correct or incorrect responses during two or more standard sessions. c. Strains completing fewer than 50 trials on average in combination with magazine latencies greater than 4 s (together indicative of reduced motivation) are excluded. d. The percentage of omission errors is calculated as follows: 100 x [(omissions) / ((omissions) + (number of correct and incorrect responses))]. e. The response accuracy is calculated as follows: 100 x [(number of correct responses) / (number of correct and incorrect responses)]. f. Intra-individual variability of correct response latencies is defined by the standard deviation of the correct response latencies. g. Likewise, the mean and the mode of correct response latencies are calculated (Loos et al . 2010). The mode of the response latencies is used as a measure of sensory-motor-processing speed. The mode is calculated according to the half rang method (HRM). HRM uses the densest half of samples in an iterative fashion to estimate the mode. The difference between the mode and the mean (devmode) of the response latencies is used as a measure of the intra-individual variability. Figure 7. Schematic workflow of the five-choice serial reaction time task (5-CSRTT) at variable stimulus duration.